Police Capture Suspect In Deadly Walmart Shooting In Colorado : The Two-Way A day after three customers were killed inside the suburban Denver store, authorities have made an arrest. 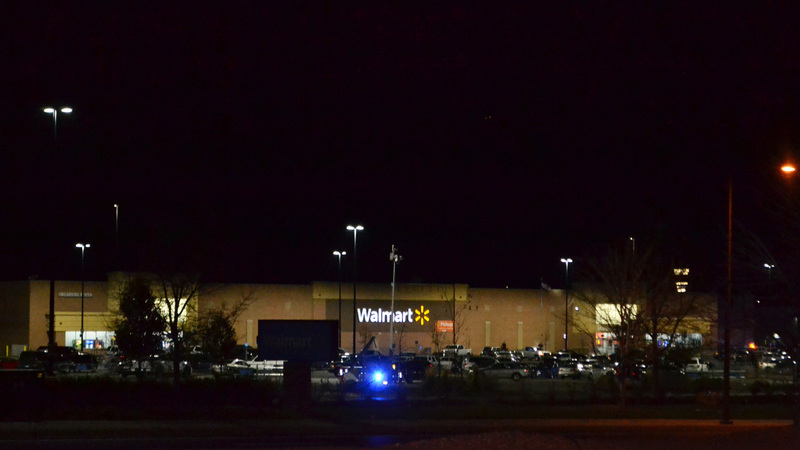 Three people were shot dead in a Thornton, Colo., Walmart on Wednesday night, and police arrested the suspected gunman one day later. Police have apprehended a man they say went on the run Wednesday after fatally shooting two men and a woman at a Walmart outside Denver as hundreds of terrified customers ran for cover. The Thornton Colorado Police Department announced Thursday via Twitter that Scott Ostrem had been arrested. The department had sought the public's help in the manhunt for the 47-year-old suspect. Thornton police spokesman Victor Avila said at a news conference that police knew of no motive in what appears to have been a random shooting. According to Avila, Ostrem said nothing as he opened fire inside the Walmart in Thornton around 6 p.m. local time. "He walked in very nonchalantly with his hands in the pockets, raised a weapon and began shooting. Then he turns around and walks out of the store," Avila said Wednesday. Aaron Stephens was paying for his purchases when he heard a hail of gunfire followed by screams from shoppers who bolted for the exits. "I feared for my life," he told The Denver Post. Ostrem escaped in a red 2017 Mitsubishi Mirage and was "armed and dangerous," Avila said. After receiving a citizen tip, police were surveying Ostrem's home in Adams County outside Denver on Thursday, when they spotted the Mitsubishi driving by. And police "successfully were able to take the suspect into custody without incident," Avila said. The Coroner's Office in Adams County released the names of the victims Thursday: Carlos Moreno, 66, of Thornton; Pamela Marques, 52, of Denver and Victor Vasquez, 26, also of Denver. A GoFundMe page for Vasquez identifies him as a father with two young children. Police say the three victims were the only ones shot; both men died at the scene while Marques died later at a hospital. The Post reports that court records show Ostrem was arrested in 2013 for driving while impaired and filed for bankruptcy two years later. "We are relieved that an arrest has been made in this case," Walmart told NPR in a statement. "This has been a tragic situation. Our thoughts and prayers continue to be with the families who lost loved ones and on supporting our associates. We will continue assisting law enforcement however we can." The Thornton shooting came one day after a truck attack left eight people dead in New York City and one month after a gunman killed 58 people at a Las Vegas concert. "You can't get that out of your mind," Hayne Rucker, who escaped Wednesday's Walmart shooting told The New York Times. "When you're in a public place and you hear gunshots, that's kind of the first thing that comes to your mind: Here we go again. Looks like this time, we are potential targets."